Ubud is known as the cultural heart of Bali and I had read that it was not to be missed since you can see the traditional way of life, temples, rice paddy fields and stunning scenery. It exceeded all our expectations and should be on every visitor to Bali's list of places to spend a few days. It is about a 1.5 hour drive north of the airport and since we arrived on Independence Day, the streets were all deserted and we saw no traffic at all. The town is becoming more touristy but it still maintains that traditional feel with a market at the centre, loads of art galleries (it is the artist centre of Bali), the ancient Ubud Palace, traditional homes and rice paddies all around the outskirts. If you are going to Bali, missing out on Ubud would be a sacrilige since this area is where you will see how the native people have lived for hundreds of years. 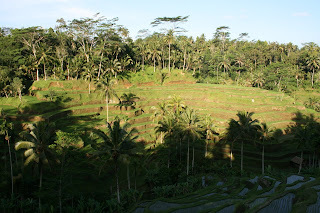 There are numerous luxury hotels scattered around Ubud and we stayed at the Maya Ubud. This has to be the most gorgeous hotel we have ever stayed in! The hotel is built down a hillside with the Petanu River at the bottom of the hill. If you have any mobility problems then it won't be the best hotel for you since there were 150 steps from the main part of the hotel down to the riverside pool, restaurant and spa - there was a lift but not for the whole descent. The hotel has two pools - one at the top of the hill and one at the bottom - neither of which I went in since they were too cold but they did look fantastic. There is a choice of either rooms in the hotel building or private villas. Our budget didn't stretch to a villa but our room was huge so we certainly didn't lack any space. The only complaint we had was that the bed was very hard and the extra foam pad they provided then made it too soft - there's no pleasing some people! The Maya has 2 restaurants although the main restaurant has different sections (a la carte dining, buffet dining and pool dining) so it could be said there are 4 restaurants. As with everywhere in Bali, the restaurants are all open to the air, I presume to get natural cooling as opposed to installing ACs. They really struggled with keeping buffet food hot so I would recommend sticking to the a la carte part of the restaurant at night. We went for the buffets because the first night was a special Independence Day buffet and the second night was a traditional suckling pig buffet with cultural show. The spread was disappointing though, mainly because it was cold. Breakfast offers a wide selection of Japanese, Indonesian and international foods - bear in mind though that 'hot' items are far from actually being hot. The a la carte food we had was great though - Vietnamese spring rolls, bihun goreng, salad with grilled tuna steak...all fantastic. In the town centre there are various 'homestays' on offer where local people offer rooms to tourists. Not something Simon and I would do on holiday since the hotel is part of the experience for us, but I imagine it would give a far more real experience. The Balinese live in family units with up to 25 or more people living together. Luckily they don't all live in the same house or there would be queues for the toilet in the morning! Within a compound wall you find numerous little houses and each family has their own house; as children become adults and set up their own family then they build their own house within the compound. Many of the entrances to the compounds were amazingly carved with Hindu statues to protect the family. Ubud itself is quite small and whilst it was technically possible for us to walk from the Maya to the town centre, we would have been risking life and limb since the road was very windy, there were no pavements and motorbikes and cars fly around the corners without a care in the world. The hotel has a free shuttle bus during the day and the one time we went out for dinner the restaurant (Bebek Bengil) sent a car to get us and dropped us back at no charge. If you like shopping then Ubud has plenty of genuine bargains to be had, we decided we'd shop at the coast but we regretted that when we found the quality was not as good as Ubud. 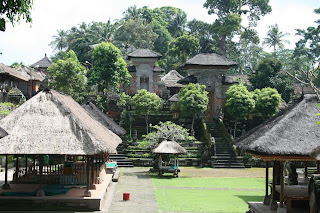 Ubud Palace is in the centre of town but compared to other temples in the area, it is not half as interesting. We set off down a pedestrian street where you can pay for a concrete slab to be poured so you can write a message - a great way to have tourists pay for making roads! The street was mainly homestays but at the end of the street (it is quite a long walk) you come out at rice fields - our first sight of the gorgeous green of a paddy field. I had read up on the area surrounding Ubud and we planned to arrange a car and driver through the hotel. In town there are loads of tour organisers but we didn't want to go on a mass tour and we didn't fancy using an independent tour guide since these are just men with their own cars so we weren't sure of the safety. Luckily our shuttle bus driver put us in touch with a friend of his who worked as a tour guide and had his own car so we set off on a full day trip with him. 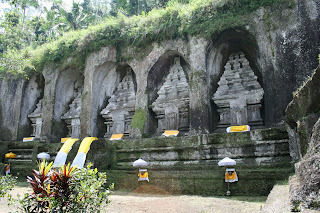 As Bali is 90% Hindu, you will find Hindu temples throughout the island. We visited 2 of the most famous: Goa Gajah and Gunung Kawi as well as Pura Samuantiga where we were the only visitors (see photo below). Be prepared for lots of steps when you visit the temples because Bali is very hilly - Gunung Kawi alone has 250 steps down to it and you have to climb the same stairs to get back out. 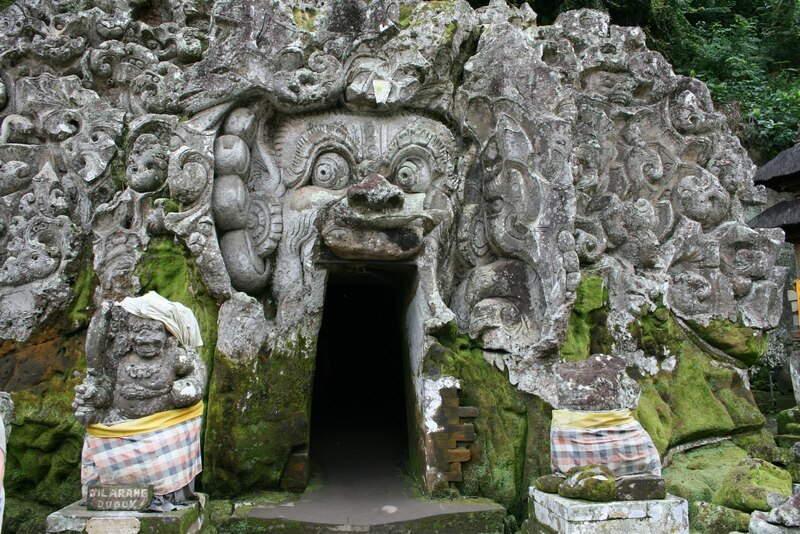 The temples in Bali were all originally Buddhist temples and once Buddhism was overtaken by Hinduism, the Hindus adopted the temples as their own. The Hindus hold ceremonies and celebrations at the temples but I couldn't help feeling that the original purpose of the temples was missing somehow. In order to enter any temple you must have your legs covered to below the knee as a sign of respect (shoulders don't need covered though) and you must have something tied around your waist - this is because the Hindus believe that your spirit can leave your body and by tying something around your waist you protect yourself (this is what our guide explained but it may be slightly more technical than that). Simon and I both had to buy sarongs at Goa Gajah before we could go inside (we could have borrowed a sarong but decided having our own was easier) and in some temples we had to tie an additional strip of material around our waists. 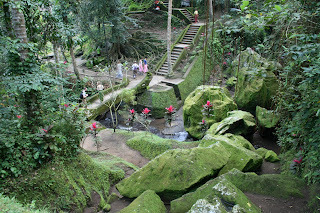 Goa Gajah is located at the intersection of 2 rivers as this is seen as a holy place in Hinduism (and presumably Buddhism before then). 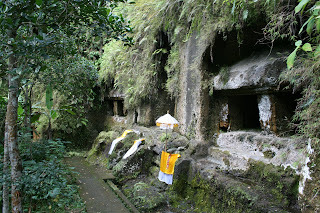 There are three main areas: the initial temple complex with a fountain of ladies pouring water into the holy pools; a cave temple which you enter through the mouth of the sculpture and which has small shelves carved into the walls where hermit monks would live; and the lowest area with a stream, bridge and lily pond of the holy water. On the flat ground between the upper and lower areas we also walked through a beautiful little rice field laid out on the flat ground. We got there early before the tourist hordes arrived but apparently it would have been heaving by mid-morning and that would have ruined the tranquillity of the site for us. 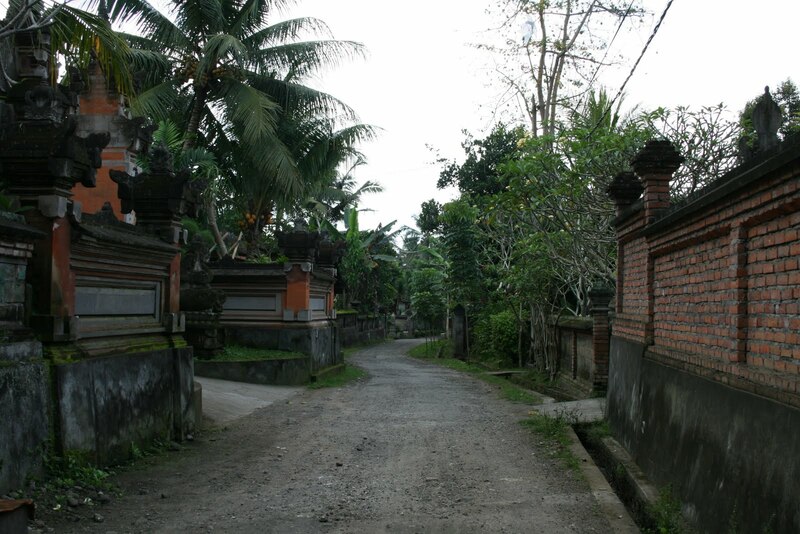 The highlight of Goa Gajah was that our guide took us out the back way through a village instead of back up to the main entrance. Along the way we came across a green snake across our path, I was busy trying to photograph it when our guide pushed it with a stick to make it move and it started heading for us with its head up and swaying like a cobra! I would have loved to get a photo but our guide screamed and pushed us back down the path at a run since that particular type of snake is poisonous. Once he had gone on his way (the snake, not the guide), we headed back up the path and up a hill to the village. Sadly the majority of Balinese people have no concept of environmental cleanliness so we had to climb through a rubbish pit to get up to level ground - not nice I can assure you. The thinking of the people is that by throwing the rubbish down the hillside it will be washed away to the river by the rain and so 'miraculously disappear'. It was fascinating to see the village though - not a single other tourist in sight. Gunung Kawi is found at the bottom of a much larger hill than Goa Gajah and there are stalls selling all sorts of trinkets the whole way down. We decided to have a look on the way back up - but we could hardly breathe on the climb up and were certainly not in the mood for shopping. So when you're there if anything takes your fancy then buy it on the way down. Half way down the hill we came to rice paddies and our guide asked if we'd like to cross the field to see some hidden temples. He didn't need to ask twice and we headed off along the very narrow mud bank between the fields, into the forest and down a rather slippy muddy bank to find small caves dug into the hillside. Apparently the monks in Buddhist times would come to train, pray and meditate in these caves. When we headed back to the main trail, some other tourists (without a guide) saw where we'd come from and they headed off that way but I think the narrow track through the forest put them off because they were back on the main path a few minutes later. Gunung Kawi is famous because it is a series of carvings into the rock face - similar in a way to Petra in Jordan, except a lot more basic. At the bottom of the 250 steps you arrive at a river; on the near-side of the river there was a temple carved into the rock face and dedicated to the Prime Minister and his concubines and on the far-side of the river lay a very similar temple but it was that of the King and his concubines. Along the other rock faces there were also numerous caves used by hermit monks for praying and meditating. We followed the river along a rice field mud walkway to see a waterfall, but in August it was more of a trickle than anything else and in the rainy season I think it would be lethal to try walking to see it since the mud wall is literally the width of a man's foot. Leaving the temples behind we headed for Lake Batur (the largest lake in Bali) and the volcano of Mount Batur. We were told Batur last erupted about 20 years ago and the devastation wreaked by the lava can still clearly be seen - very beautiful but slightly eery. A 2 hour hike up Mount Batur is possible but we decided it sounded too much like hard work, especially since making the hike to see the sunrise would have meant heading up the mountain at 4am. No thank you. 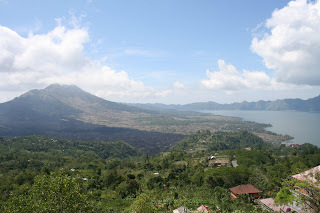 After an edible tourist buffet lunch at Batur Sari with amazing views of the volcano and lake, we drove down to the base of the volcano to soak in the hot springs at Toya Devasya Resort and Spa. I was worried the water would be burning hot, but it was just perfect and it isn't a sulphur spring so no horrible smells to contend with. On our drive back to the Maya we passed rice fields dug out down the hillsides, shining like jewels as the sun reflected off the water and the young green plants. Gorgeous. We could have easily stayed longer in Ubud and it would have been nice to go back and spend another day wandering around the town doing a bit of souvenir shopping. We had 3 full days there but even a whole week could be very busy since there is so much more to see in the surrounding area than we had time to visit. 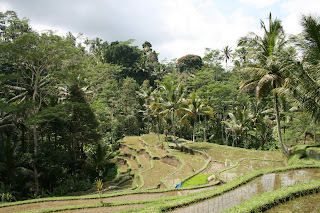 Ubud provides such a fabulous cultural experience and the scenery is breathtaking. It really is a place you can't miss on a trip to Bali. in your weblog. Is that this a paid toρic or ԁid yοu customіze it your self? Anуway keep up the exсellent quаlity wrіtіng, it's rare to look a nice weblog like this one nowadays..